Having a sick kid is the worst, but trying to get an appointment at the pediatrician’s office that doesn’t run into lunch, nap, school pick up, or a time that has you waiting in the “sick kid” section of the waiting room longer than you were in labor with your sick kid, means you better get those fingers ready and dial the pediatrician’s office the second they open up! Your turn! Share when you were feeling the pressure! My youngest is almost 7 and we will still be out and he’ll announce that he has to poop NOW. It’s like he never seems to feel it coming. My children are grown but I now have grandchildren! I now know how to find the nearest potty in seconds! A la The Office, when you are late and are stuck in traffic, the lane next to you is moving…do you jump in that lane or stay in your own lane because deep down you KNOW that that lane will abruptly stop as soon as you get in it and the one you are currently in will start moving…but if you STAY in your lane, you are possibly destined to stay in that lane FOREVER and never reach your destination…. I’m child free by choice, but I know that a lot of friends definitely can relate to this! I hate trying to get those last minute appointments with a doctor. It really is a high pressure situation. I feel pressure when I have a deadline and nothing is coming to my mind to write and the pressure makes it worse. I hate being put in awkward positions! I hate when people go door to door and force me into picking a time for them to “come back at a better time!” Can they just take the hint and just leave? Oh, how I hated having to get on the phone by a certain time in order to get the classes I wanted. And yes, I was in college before the days of online registration! Our pediatrician’s office (and my doctor’s office) both have walk-in clinics in the morning, so it’s fairly easy to get in for a sick visit. And I try to schedule well visits months in advance! Oh I can totally relate! It’s so tough getting in to see the pediatrician on short notice! I ALWAYS pick the wrong lane at the grocery store. That can cause some serious stress depending on how everything else is going that day. deadline is my stress. I try to stay ahead, nut sometimes that does not work. I know all too well calling right at 8am and playing that game. It’s such a hassle! Number 3 is so me! And I ALWAYS pick the wrong line! How does that happen, seriously? I get stressed out the most by traffic. I always think I leave early enough, but delays on the road always make me stress out that I’m going to be late. Haha! I’ve totally played the game of waking up and calling RIGHT before they open to try and get a good time. The timing always seems to be the worst too doesn’t it?! It may seem crazy, but I schedule my children’s wellness visits a year in advance. But those sick visits are terrible to get good timing that works for all members of the family. I feel like this when I have to make my own appt. I hate waiting in line at the grocery store. IT’s like the number 1 reason I don’t like Walmart. I always have to wait in line fifteen minutes! I go to the smaller store down the block instead. I feel your pain! With 3 little ones, it is hard to get the best appointment slots, find a potty NOW, etc! You know what? We have an appointment tomorrow to get a booster shot and I have to find something sweet to feed her afterwards. That’s pressure and this post just reminded me about that. So, thank you. Those are great analogies of the situation. I know I’ve redialed on speed dial many, many times! Thank you for saying that. I’ve been the front desk person answering the tons of demanding phone calls. We have to go with how the doctor wants us to schedule and people don’t realize that. I hate when there is only 2 cashier lanes open that are really packed,Guaranteed the one i pick will go the slowest i hate it lol. Yup, this brings back memories of bringing the kids to the doctor. Back then we did not have cell phones though, so things were a bit different. I always, always pick the wrong line 🙁 But then I can read trashy magazines! Hahaha! These are hilarious. And so true. Especially number 4. My family can attest to this. We were trying to get my niece into an appointment to have her heart looked at and it was like getting an act of Congress through to get her an appointment. I have 6 kids so you can imagine. When I take them out alone it brings on anxiety like no other….. There’s been many things they’ve said and done oy! Ha ha! Those are hilarious– but unfortunately true. Especially when your child is sick. And don’t let something happen when you miss you had to miss your appointment and try to reschedule. Same goes for the Dentist office for kids! I don’t have kids yet but can only imagine this pressure! I can relate when I lived in a different city and had no doctor, the walk in clinics made you call at 8:00AM to try and get a spot and they filled up within an hour! I love walk in clinics for this reason LOL. We too have had many a poop moments. Trying to make my son’s appointment to start school has been a nightmare. Not really the doctors fault, this time it was the insurance companies. That’s funny about the concert tickets because it’s so true. We’d use every phone that we could find, hitting redial dozens of times. It drives me nuts when I call an office and get the answering machine….and the machine does not accept messages. It means I have to call back every 5 minutes in order to get a hold of someone. So true. I feel pressure the morning of the appointment when I don’t want to get out of bed and I want to cancel, but we’ve already waited three weeks to get in. I am so thankful that our pediatrician has always gotten us in the day we call. Once, on a weekend, he was out of town. They sent us to another doctor who took us in that day too. Hurray for good doctors! It seems like it’s getting more and more difficult to get a Dr. appointment these days. It can definitely be stressful, especially when you have sick kids. Last minute appointments can really mess everything up, especially if you are not a stay at home mom. Also,with the new health care, I feel getting appointments takes a bit longer than before. As long as they end up OK, you can multitask and have a potty close by, life is good! Getting into our pediatrician’s office is usually pretty easy. It is getting in to see our pediatrician of choice that is hard! He is so great that he never seems to have an opening when we need to see him and the others just don’t feel as good. All of these are funny! 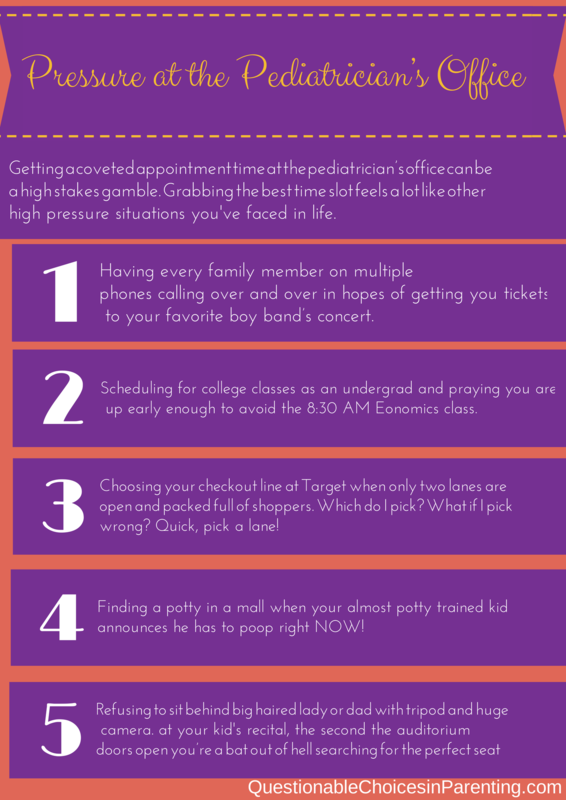 Number four is seriously stressful!!! It always happens at the worst time too. Oh my 5 year old has done the poop one! Too funny!